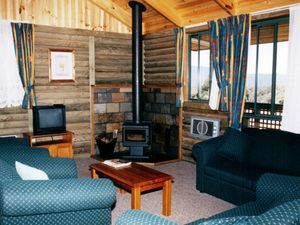 Accommodates up to 6 people in this relaxing 2 bedroom log cabin. These are quite large with a queen size bed in the main bedroom and two sets of bunks in the 2nd bedroom. Full lounge with furnishings, wood heater, remote control TV, air conditioning, large kitchen / dining with dish washer. They all have verandah with table settings. Blankets and pillows provided. BYO linen. Double bed in the main bedroom and two sets of bunks in the 2nd bedroom. Full lounge with potbelly wood heater, TV, air conditioning;full kitchen / dining; bathroom. The Deluxe cabins are individual out by themselves. Standard cabins are adjoining and share the centre wall. They all have verandah with table settings. * Blankets and Pillows provided. You will need to provide your own bed linen and towels. ( If required, bed linen can be hired - $15 per bed ).